Under normal circumstances, this is a review you never would have gotten to read. As the Dark Knight Detective, Batman must protect Gotham City from the maniacal Two-Face. If it seems weird that the packaging text would call out Two-Face and not one of the other villains, fear not: it's referencing a specific story. The first arc of Scott Snyder's All-Star Batman involved Batman trying to transport Two-Face while bounty hunters chased them. 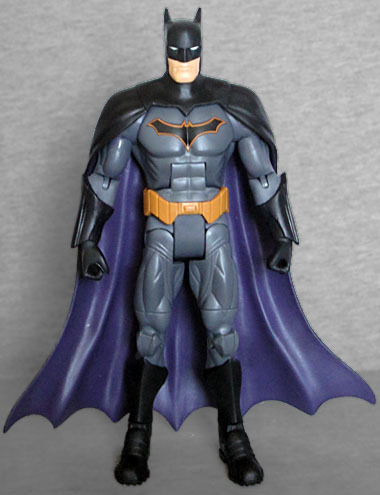 This figure is based on Batman's "Rebirth" costume, the one he wears in DC's newest soft reboot. It changes several of the things that were wrong with the New 52 suit - no more attempt to make it look like armor, for one thing, so instead of seams and panel lines all over everything, he's really only got protective kneepads. There are wrinkles at the top of his legs, where trunks would be, and the torso is more squarish then Mattel DC figures usually are. 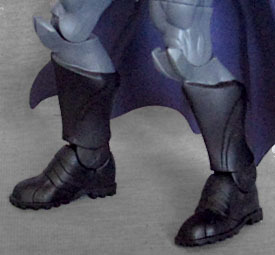 He has plates of armor on his gloves and boots - a very "Arkham videogames" touch - and the utility belt is this weird, wavy shape. The New 52 suit was dark grey with a black cape, so it really lacked a visual punch. The new suit has been lightened, slightly, though it's still dark, but there's now more of a separation between it and the blacks. The lining of his cape is purple, though it's a very desaturated shade; it adds color to the figure, a color that's been part of Batman's palette since the beginning, but isn't bright or overpowering, which would break the look. His belt is a deep, mustardy yellow, and his chest symbol has the same color as a thin outline around it, a feature that seems to have been inherited from James Gordon's batsuit; it's not a big yellow oval, but it helps set the black bat apart from the rest of his chest. The belt is supposed to be black with yellow outlines, but Mattel didn't paint that accurately. The costume was designed by Greg Capullo, and the sculpt of the head really looks a lot like his artwork! The set of the jaw, the depth of his scowl, the spacing between the eyes... it's all Capullo. One of the changes made to the suit is the mask, which now has a smooth line between the forehead and the nose, rather than having the nose stick out separately. 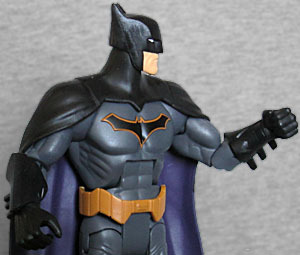 Batman has the usual Mattel articulation, but in his case, it's slightly limited by the cape. Remember how Young Justice Batman's cape came down in front of his shoulders, rather than behind it? 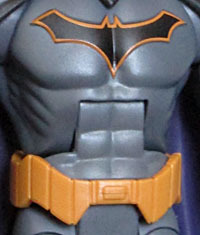 This does the same thing, just with a sculpted seam between the cowl and the cape, and a pointed edge on his collarbones. Having the cape drape like this was cool when Young Justice did it, and it's cool now, but the range of the shoulder joints is unavoidably limited by the choice. Batman has no accessories, just a piece (the right leg) of this series' Bat-Bot BAF. Batbot isn't a very exciting BAF, so I had no intention of building it, and thus no intention of buying this figure. But when I found him and the rest of the series at KB Toys (yeah, you heard me, that isn't a typo), I decided to get him. Mainly as a souvenir of the day, because Batman himself is kind of a dull toy, even if the costume is better than what he was wearing before.